I finally got a chance to test drive the the Tesla Model S P85D, and after eight long months I can say it was worth the wait. I finally got a chance to test drive and review the $133,320 red Tesla (TSLA - Get Report) Model S P85D after the company unveiled it in September 2014. After eight long months, I can say it was worth the wait. I test drove the P85 Model S about 18 months ago, so I knew what I was getting into in terms of the style and luxury inside the car, as well as the power I'd feel getting behind the steering wheel. Once you're sitting in the $3,500 black, next-generation driver seat, you notice just how much more this is an experience than a car. It's something that you need to let your sense of sight, sound, touch and smell (new car smells are the best!) experience. I felt invincible. Every car has a theme song and this one almost punches you in the face it's so obvious -- the Superman theme song. 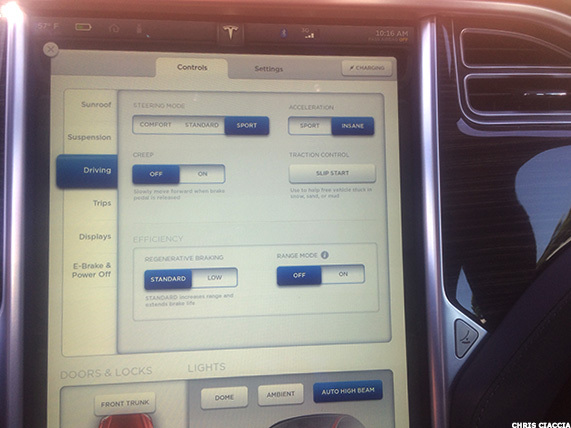 The 17-inch dashboard is incredibly easy to use, almost to a fault. It's essentially a giant iPad, with touchscreen controls for everything, from the sunroof to climate control to media, navigation, the calendar, energy usage, the Internet and connecting to your phone. Tesla recently updated its software to Version 6.2, designed to end range anxiety -- the feeling drivers get when they're about to run out of a charge. Aside from the dual motor, this is one of the more important improvements Tesla has added to the Model S, allowing drivers to look up Supercharger stations in real time, plan trips, automatic emergency braking and a host of other features. 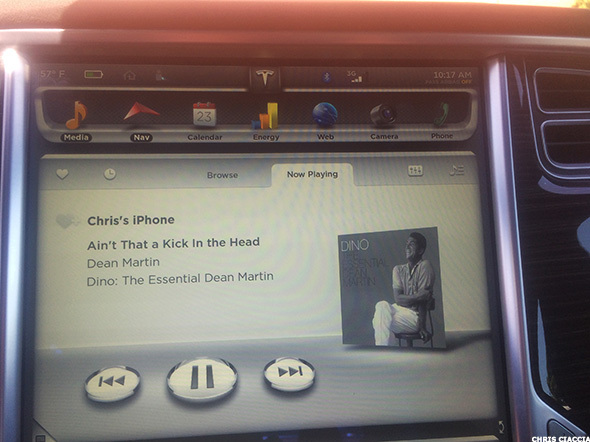 Adding your phone to bring media, your contacts or your calendar to the car is incredibly easy, using Bluetooth. Set up could not have been simpler and after a few short minutes of adding my music, contacts and events, I was on my way. After navigating the construction of Hoboken and North Jersey in general, I was able to get on Route 78, where I discovered Insane Mode, which allows the car to become more than a car. It allows the Model S to eat asphalt and never look back, destroying nearly every other auto in its path. It's the software and hardware equivalent of Megatron from The Transformers. Switching the acceleration from Sport to Insane allows the car to go from 0 to 60 in 3.1 seconds, with 691 horsepower, an unheard of time and amount of power for any car not named Ferrari, Lamborghini or almost any Italian or German luxury sports car. If you're sitting in the passenger seat, think of it this way -- the feeling (and thrill) you get from going downhill on a roller coaster, that's the feeling you get in Insane Mode. This kind of performance will cost you, though, with the performance dual motor adding $34,600 to the $69,900 base price of the car. Superman may be faster than a speeding bullet, but going up against a Model S in Insane Mode, the Man of Steel would get a run for his money. Pure speed and power is where the P85D shines. With any electric car, drivers go from 0 to full torque instantly, which allows for a splendid driving experience, letting you experience everything the Model S has and more. The P85D offers an 85 kWh battery, which has offers an 8-year, unlimited-mile battery warranty. Like the other versions of the Model S, it's built like a tank. With the extra weight from the dual motor, the car added an extra 300 pounds to its original weight, but it still feels incredibly safe and well-built. It's almost like being in the most beautiful armored tank ever. If you have any concerns about it, the National Highway Traffic Safety Administration, NHTSA, awarded the Model S a 5-star safety rating in every sub-category, making it one of the safest cars ever reviewed. Tesla claims an EPA range of 253 miles on the P85D version, but when I went to the Supercharger in Edison, NJ, it registered a full charge at 234 miles, taking about an hour to fully charge. The 19-mile difference may have been relegated only to my car, but it was a bit of an annoyance. I also had issues charging the car and unfortunately, I'm not alone in this regard. After charging the car, I had difficulties taking the charging cord out of car's charging port, not once but twice. While at the Supercharger station in Edison the first time, another Model S owner experienced the same problem. Luckily, I was able to reboot my car and it popped right out. The second time, I hit the top of the hood on the key fab (thanks to the kindness of another Model S owner who had a similar issue) and it popped out. It's more of an annoyance then a major issue, but I shouldn't have had to struggle to take the charging cord out of the car. I drove around 400 miles or so in the car for four days. That's a fair amount of time judging, testing and getting a handle of the car's performance. At around $130,000, the P85D isn't for everyone and it sure isn't for everyday driving. But aside from the charging issues, it's one of the best, if not the best, luxury sedans; and it's one that's sure to please any driver.